I don't mean to alarm anyone but there's been a bright yellow orb in the sky for a couple of weeks now. I know what you're thinking, 'Don't be daft, sure it's only mid June' but I'm telling you, Jean Byrne forecast this and for once she was right! There's nowt like a ray or two to encourage us to cast off the waders of winter and get our tootsies into something a little more flattering and with the help of PurpleTag.ie, I've picked out some summer sandals that won't break the bank. These wedge sandals have a padded insole and a height boosting but back friendly wedge. With leather uppers and bright yellow detailing, you could style these summer friendly sandals up or down to suit your occasion. They're on offer now too. Can the Hubes do any wrong? The short answer is 'Hellz NO', just one peek at her shoe collection will show you just that (her photobooth skillz will reaffirm if needed). The Irish funny woman has given us something just a little bit gorgeous with the Bourban sandals. With patent straps and a rope effect wedge, you've got all your summer trend textile needs met with these bad boys. These flexible high quality leather sandals sing summertime to me. I see the bight colours and I want a holiday, immediately. Again, a multi-purpose sandal that could bring you from the office to the beach and out of an evening. If you live and work near a beach that is, in which case I hate you but your shoes are awesome. These Geox wedges are the most expensive of the lot but with ergonomic design and breathable Italian leather, they're also my favourite. The beaten coffee colour means they're wearable with most all of your wardrobe and the design means you'll be hella comfortable doing it. I fell a little in love with Geox having worn their wedge trainers so these are the ones next on my never ending list of wants. 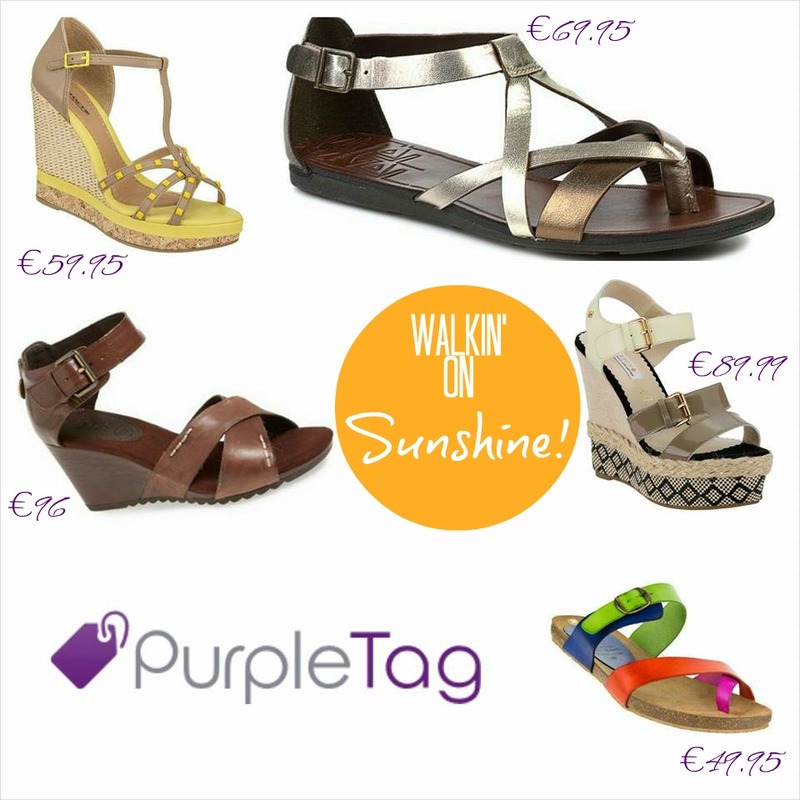 All of the above lovelies and oodles more can be found on PurpleTag.ie. They're an Irish online shoe company that promise to take the hassle out of shoe shopping with affordable prices, free delivery and free collections (from your home) should you not be 100% happy. The kind folks over at Purple Tag have given me a 10% discount for all CherrySue readers should you find a pair of brogues that you just have to have. Simply input the code CherrySue at checkout.